[S49] Edna Valentine Bruce Notes on Barteau, Valentine, Coles, Trapnell, and other family lines, Edna Sarah Valentine, (Unpublished), Notes on Valentine family. [S436] Alfred Mudge, (Alfred Mudge & Son, 1868), Mary Jane, b April 23, 1857. [S504] Mary Valentine Headstone, Mary Valentine Sleigh, Daughter of John Titus and Elizabeth Mudge Valentine, Wife of Arthur H Sleigh, Born April 23 1857, Died Feb 23 1942. [S436] Alfred Mudge, (Alfred Mudge & Son, 1868), She m. John T Valentine, Nov 27, 1834. He was son of Lewis and Jane, b. June 29, 1807. He is a farmer, and carries on a large farm. [S437] Hughes, Thomas Patrick, 1838-1911. cn; Munsell, Frank, 1857-, (Munsell, Albany, NY 1898), son of John Titus Valentine, b June 29, 1807, d Aug 15, 1884 (m Nov 27 1834 Elizabeth Mudge, b. Nov 25, 1816. d. Oct 8. 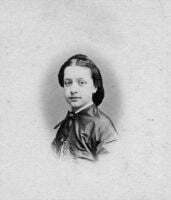 1875. dau. of Jacob and Hannah [Titus] Mudge, and gr-dau. of Coles and Dorothy [Coles] Mudge and of Samuel and Abigail [Robbins] Titus).